Quickly and evenly spread liquid fertilizer or insecticide throughout your lawn using the RL Flo-Master Heavy-Duty Backpack Piston Sprayer. This generous unit makes distributing liquids simple, thanks to its thoughtful design and durable construction. The plastic tank on this unit holds up to 4 gallons of product, and raised indicators on its side help you monitor your liquid level in moments. The 5.25" diameter mouth with included strainer ensures easy, no splash filling of the tank, and its metal base keeps the unit stable while filling. A powder coated, metal handle connects to either the left or right side of the tank for fantastic versatility, and its ergonomic grip makes it simple to pump. A 49" long, reinforced hose leads from the sprayer to the plastic wand, for directing spray just where you want. The wand includes two different nozzles, for creating either a fine, wide mist or a direct stream of your fertilizer or miticide. Two, padded and adjustable shoulder straps make it simple to transport this sprayer throughout your garden. A red cap covers the tank, and a built-in clip here holds the wand in place when not in use. 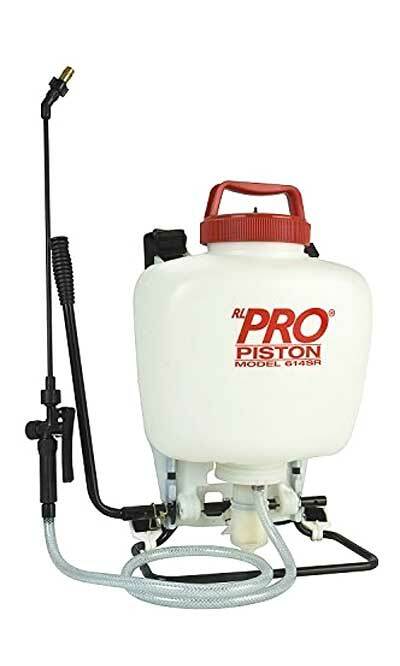 Easily apply fertilizer to your lawn with this Heavy-Duty Backpack Piston Sprayer. Limited lifetime warranty.